AQAP fighters waving al Qaeda’s black flag in front of the Yemeni Army’s 19th Infantry Brigade Base, which it captured earlier today. Early this morning, al Qaeda in the Arabian Peninsula (AQAP) seized control of the Yemeni Army’s 19th Infantry Brigade Base located in the Bihan region of Shabwa province. According to a statement released by AQAP, the assault on the military base began at 4:00 a.m. when clashes between AQAP fighters and Yemeni soldiers initially erupted. AQAP penetrated the base using a well-established tactic of ramming a vehicle packed with explosives into the perimeter, then “storming” it with well-armed fighters. At around 5:30 a.m., an AQAP suicide bomber named Abu Suhaib al Adani detonated his vehicle-borne improvised explosive device (VBIED or suicide car bomb) at the base’s main gate. AQAP claimed that in the course of fighting that followed the suicide bombing at the base, the group managed to take control of three guard towers, incapacitate one tank, and take six Yemeni soldiers hostage. AQAP also said that clashes continued for three additional hours until their fighters managed to assert complete control over the base. 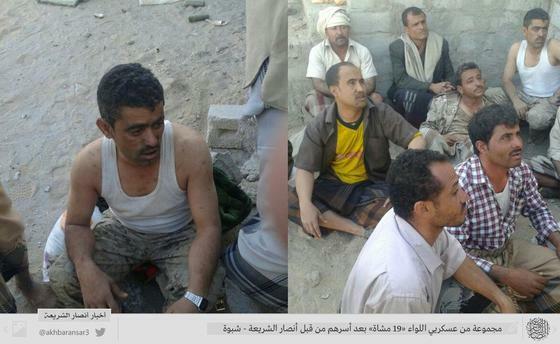 Moreover, jihadists reportedly captured another group of Yemeni soldiers during the fighting. 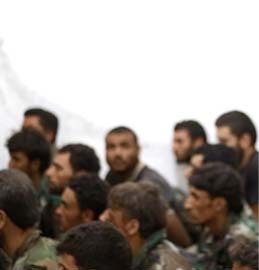 A secondary statement released only an hour after the first claimed that the base’s commander along with all the troops in the base voluntarily surrendered to AQAP, who ultimately released them all following negotiations with the tribes of Bihan. This secondary statement also provided some more alleged results of this morning’s attacks. AQAP claimed that five Yemeni soldiers were killed and many others wounded. 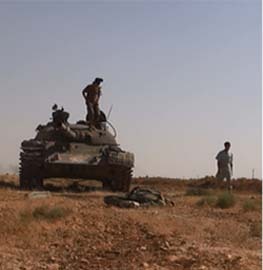 Additionally, the jihadist group indicated that one of its fighters, Abu Turab al Qayfi, was killed and that nine others were lightly wounded. 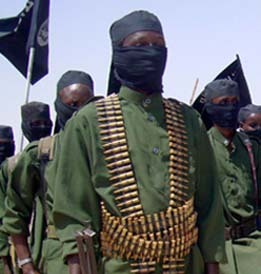 Armored vehicles, light and heavy weaponry – including Kalashnikov rifles, DShK anti-aircraft machine guns, ZSU-23-4 anti-aircraft weapon system, and a cache of ammunition – were allegedly taken by AQAP as booty. Local news outlets in Yemen reported this morning that between one and three Yemeni soldiers and four terrorists were killed in the AQAP attack. Moreover, some news organizations claimed that the base was being surrounded by local tribal forces, who appear to be attempting to contain AQAP forces at the base. AQAP’s justification for the attack was that it had received information indicating that the base was about to be handed over to Houthi control. The Iranian-backed Shia Houthis rebels and the Sunni jihadist group are enemies and have been battling in central Yemen. AQAP previously controlled much of Shabwa and neighboring Abyan province between the spring of 2011 and the summer of 2012. Yemeni forces, backed by US airpower, which included drone strikes, drove AQAP from overtly controlling much of the two provinces. Since losing control of the south, the jihadist group has been waging a guerrilla campaign against security forces and the government in southern and central Yemen. AQAP is flexing its muscles in southern Yemen as the Houthis overran the capital of Sana’a and forced President Abd Rabbo Mansour Hadi and the government to resign. Hadi was a staunch supporter of US counterterrorism efforts in Yemen, including drone strikes against AQAP, despite local and international criticism. The Houthis, a Shiite minority that is backed by Iran, is no friend of the United States. The group’s motto is “Death to America,” and it is expected that support for US operations will wane as Houthi influence grows. The US abandonment of its embassy appears to have been hastily conducted as military and diplomatic personnel were forced to leave on a civilian rather than a military flight. US Marines who guarded the embassy destroyed their crew-served and personal weapons before boarding a civilian flight out of Sana’a, according to USA Today. Twenty-five embassy vehicles were confiscated by Houthi rebels. US personnel at the embassy destroyed files at the embassy to prevent confiscation. The Yemeni military and security services, which have been fighting AQAP in southern, eastern, and central Yemen, have been unable to halt the Houthi advance from the north, which began late last summer. Yemen’s security forces are said to be in disarray as they face duel threats from both the Houthis and AQAP. The US military has attempted to paint a positive picture of the status of Yemen security forces despite their recent losses. Just one day before the US and British embassies closed, Pentagon Press Secretary Rear Admiral John Kirby said that security cooperation would continue with the Yemeni military. “[W]e still have special operations forces in Yemen, we continue to conduct counterterrorism training with Yemeni security forces, and we are still capable inside Yemen of conducting counterterrorism operations,” Kirby stated when asked if US forces could continue operations in Yemen despite the Houthi advances. President Obama previously praised the US counterterrorism strategy in Yemen as “one that we have successfully pursued.” Despite launching 109 drone and conventional airstrikes against AQAP’s leadership, the core of the group, including its leader, Nasir al Wuhayshi, who doubles al Qaeda’s general manager, remain alive. On Jan. 31, the US scored a small victory as Yemen continues to collapse. US drones killed Harith bin Ghazi al Nadhari, a senior and influential AQAP sharia official, in a strike in southern Yemen. The humor’s choice, but Custer was, without a doubt, a warrior. A better comparison for Kirby might be Baghdad Bob. 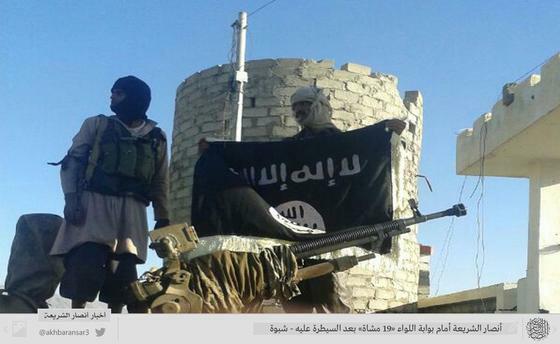 How can you tell the difference between al Qaeda’s flag and Islamic State’s? Purportedly, alongside the deteriorating security conditions both the US and UK Embassies closed because AQAP has fragmented with a portion of fighters swearing allegiance to Islamic State. This particular attack has a few IS TTP’s involved; suicide initiation then “storming”, or “swarming” the target. There also hasn’t been an attack like this from AQAP in some time. Is it not possible this attack was conducted by the splintered AQAP/IS group as a capabilities demonstration? AQAP’s quick claim of it makes sense if they are trying to slow the haemorrhaging of fighters to IS. Usually when jihadists make baya (fealty pledge) to Caliph Ibrahim in Raqaa their territory becomes a wilayat (Province) of the Islamic State (Caliphate). 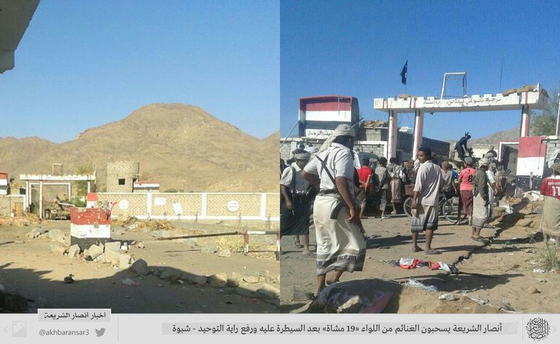 The image above would tend to indicate AQAP in Yemen has made baya and they are now Islamic State fighters in control of Yemen’s former 19th Inf Bde base. Brother, the TTP that involves suicide or VBIEDs initiating contact followed by a swarming shooters is one Al Qaeda used early on in Saudi Arabia. The early strikes I’m remembering evidenced a high level of detailed pre-planning for each unique target, another AQ hallmark. Recall the 12 May 2003 attacks in Riyadh at the three compound residencies for westerners. 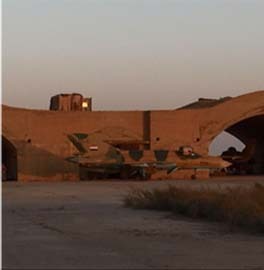 Large VBIEDs took out security gates or blew holes in the perimeter walls followed by shooters who swarmed the compounds. A friend of mine survived the assault on the Vinnell compound and called me next morning at CLFCC Doha KU to say he survived. 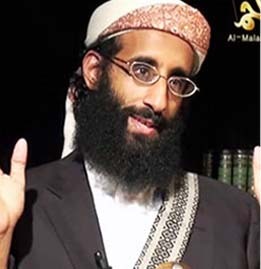 Something else about AQAP baya to become IS — we must assume the terror threat from IS now extends directly to the US Homeland, particularly where deceased former AQAP Anwar al-Awlaki heralded from – the Dar al-Hijrah mosque in Falls Church, VA.
@Sean Osborne, I don’t think so. 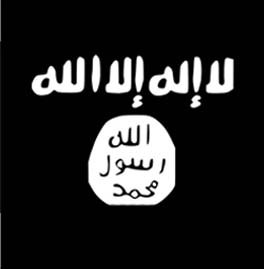 Al-Shabab in Somalia and AQAP have both used the same flag long before it became the “official” flag of the Islamic State as it bares the Islamic declaration of faith and is similar to the flag used by Prophet Muhammad when he went into battle and stamp with which he signed documents. So IS by no means has a monopoly over the symbol, although it has now come to be associated exclusively with them. Although there has been some rumblings about small numbers of AQAP splintering off and giving baya, AQAP as an organization is still very pro-Zarawhri and anti-IS. Likewise, IS openly rejects AQAP due to their opposition to their caliphate. Had this attack been carried out by IS’s official Yemeni wilayat which was announced a couple months back, AQAP would not have claimed responsibility for it.